The Acting Legend Mohammad Ali passed away in Lahore on Sunday, March 19, 2006. He was 75 years old. He was a cardiac patient and underwent two surgeries. Mohammad Ali was born into a religious family in Rampure, India on April 19, 1931. His father Maulana Syed Murshid Ali was a scholar. His family later migrated to Multan and finally settled down in Hyderabad (Sindh) where hei started his showbiz career as a Radio broadcaster from Radio Pakistan Hyderabad in 1956. His film career began with a Karachi made film Chiragh jalta raha in 1962. He was villain actor in some films but since film Shararat (1963) he played the hero roles. Mohammad Ali got breakthrough from film Aag ka Darya and was on the top in the next ten years time. Mohammad Ali or Ali Bhai will be remembered for his emotional acting and the best dialog delivery among the film actors in Pakistan. Khamosh Raho, Saiqa, Insaan aur Admi, Insaaf aur Qanoon, Salakhen and Doorian were some of his all time best films as actor. 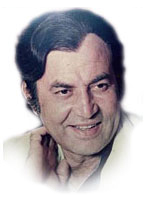 Mohammad Ali produced two films Aag (1967) and Jaise jantey nahin (1969) and was co-producer in film Aadil (1966) and Hatim Tai (1967). He was married with famous actress Zeba since 1966..